Opposition leader Sergio Massa on the IMF deal, economic turmoil and why it’s too early to think of elections. 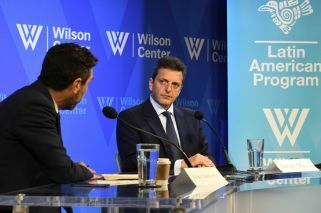 After his talk at the Wilson Center, Renewal Front leader Sergio Massa gave an interview to the Times and other news organisations. While Massa, who discussed his Peronist “alternative for Argentina” fledgling grouping, said he hadn’t decided whether he would stand as a presidential candidate for next year’s election, his mannerisms, declarations and even, what he avoided saying, seemed to indicate otherwise. In this interview, the opposition leader gives a more in-depth view of his political project and offers his opinions on Argentina’s economy and the government’s agreement with the International Monetary Fund (IMF). Can you expand on your ideas about the importance of value-added exports, that you discussed in your speech? This is an issue of creating jobs more than anything. I also have talked about transforming social and employment programmes and tackling informal labour. I think Argentina’s most pressing problem now is that there isn’t a culture of work or serious programme in any political or economic project. You were very hard on the IMF in your speech, an issue that here in Washington can cause resentment. Clearly, between the Fund and the Argentines, I choose the Argentines. Whether I’m in Washington, in Milan or Rio de Janeiro. And you would renegotiate the terms? First, we are going to take a look at what is the new memorandum. But basically, the general lines are known. No, because there was a change of goals. No. It seems like you are evading answering the question because you aren’t saying what you would do, or reform, etc. It is not [a] minor [thing], to see exactly what are the commitments the government made in the IMF agreement. Because it defines credit policy for investment, interest, etc. It represents exactly what the Central Bank can do to support this policy, and what is restricted by the agreement. Also, the issue in itself is that Argentina shouldn’t have gone to the IMF, it should have made a massive offer to Argentines that have money abroad. Isn’t that a bit naïve? To think that those Argentines would bring back their money, to have the confidence to do so? But the IMF is generally cheaper. It’s more expensive in other ways, in social terms. Yes, it is tiny in terms of its budgetary impact, in a moment when Argentines are frustrated and discontented. Is the zero-fiscal-deficit policy bad? No, it has to be an objective for all the governments. Now, it has to be accompanied by an export surplus. The balanced budget is only one view of Argentina’s economic reality. The GDP, monetary emission, plays a role in financial terms. You know what the problem is with the Fund? We keep on looking to balance our budget and Argentina was doing well each time when it had a surplus in its trade, not the government budget. And it’s what sustains you better, and gives you more freedom with your budget. Well, it could be going in that direction. With the depreciation, it gives you a competitive advantage that in the medium term could lead to that trade surplus. But the problem that you have is that credit is very restricted because of our interest rate: 80 percent interest rates. When the state says it will pay you 80 percent interest rates, it’s doing that so that you won’t lose money against inflation. Are you all conscious of that? It’s insanity. No-one will invest in generating work and production in Argentina with 80 percent interest rates. The social diagnosis you gave of the difficulties, of poverty, people that aren’t doing well. What do you think about December? Are you worried? I think that the mayors and [Buenos Aires Governor Maria Eugenia] Vidal are doing a good job, at least in the metropolitan area. Are they providing the necessary social support? I think that they are at least putting in the effort. Mayors, and Vidal, and social movements are working, and the Church. That is what I see functioning. Now, I don’t know how Rosario and other places are doing. Do you think you will end up competing against Vidal and not Macri? Or is it the same? No, it’s not that It will be the same for me. Vidal, I saw as a possible candidate because of an article. But I’m not clear what the administration is doing. I don’t know how it will finally be decided. Do you think [former president] Cristina Fernández de Kirchner will be a candidate? I have no idea; I don’t know the criteria each party will use to define their candidates for next year. The election is far away from the painful economic process that is going on. So, to talk about your candidacy now is ridiculous. It is in August next year. The electoral groups or candidates aren’t even really defined a month beforehand. How will the primaries work for you and your allies (the ‘Alternative Peronist’ front)? We said there would be a primary. But I want to repeat that we’re going to build an idea, really a project. That is what we need and are going to focus on. The government says that the notebooks graft scandal affected the economy. Do you think that? For example, with public-private public works projects (PPPs)? The PPP’s don’t have funding because of the context, because of the interest rates, the price. The high costs. So, you don’t believe the government in that sense? It’s not that I don’t believe them. What I don’t understand is how that would be the situation. Why would people stop selling, because of the notebooks scandal? All the time, there is a new excuse. One time it’s the international context, another time is the notebooks. Here is a failure of the economic plan. There wasn’t a plan or a real project. They promised zero inflation, zero poverty; they generated these expectations that have nothing to do with reality. What do you think of the commercial relation between Macri and Trump with the United States? Do you think the notebooks scandal will influence the elections? I think it will be very difficult for candidates that are implicated in corruption cases to run. It will be an issue in the elections. What do you think about [Macri’s political advisor Jaime] Durán Barba’s comments, saying that the economy won’t be an important issue? There are other sectors that say that corruption won’t be an important issue. Each group tries to hide vulnerabilities. Are you going to see investors? I’m going to tell them to invest in the real economy. To invest in the private sector that has businesses supported in the real economy that will give returns in the medium term. If only, I hope so. The government’s growth figures have been delayed repeatedly every quarter. Now we are supposed to grow at the end of their mandate. Is [Roberto] Lavagna still your chief economic advisor? Yes, absolutely. And for me, he is the person most authorised to talk about Argentina’s economy. His model should be the country’s goal. A budget and trade surplus, a competitive exchange rate and growth. He led the most crucial debt restructuring process in history.